Active since 1997. Canadian. Known for installations, performances and writings that employ diverse media to rework iconic images and traditional forms as they are expressed in pop-cultural, artistic and political movements. Exhibitions include Contemporary Art Gallery (Vancouver), Künstlerhaus Bethanien (Berlin), Smart Project Space (Amsterdam), and Project Art Centre, Dublin, and group exhibitions at the Power Plant (Toronto), the National Gallery of Canada, Taipei Fine Arts Museum, the Seattle Art Museum, La Kunsthalle Mulhouse (France), Witte de With (Rotterdam), and the 19th Biennale of Sydney. 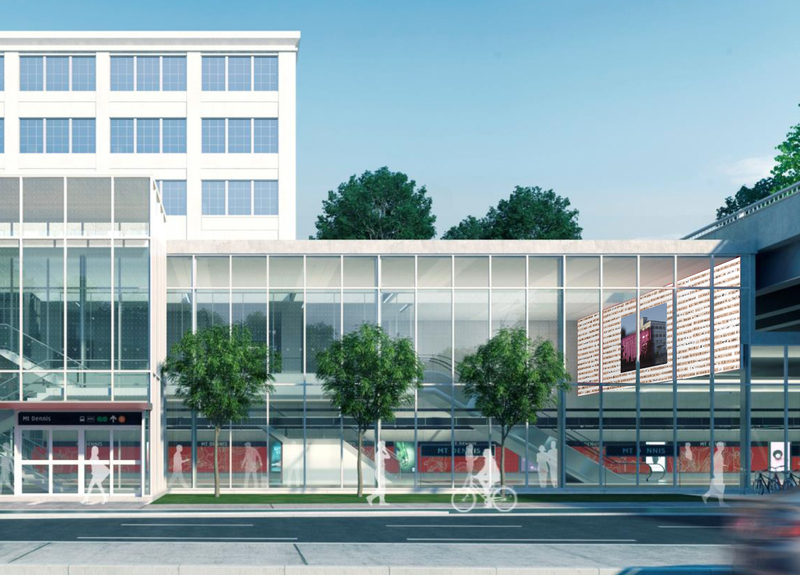 Up to This Moment is a video artwork installed in the upper concourse of Mount Dennis station, visible from Eglinton Avenue. The artwork is an evolving visual archive that documents the changes at the site of Kodak Heights, in the local community of Mount Dennis. Inspired by Ovid’s epic poem Metamorphoses, the video presents a different moving image of transformation every day. The background to the video screen is made of glass panels imprinted with a text collage, offering a meditation on creation, destruction and renewal. Born 1985. Canadian. Known as a photographer, she has recently worked in monochromatic colour studies. Cwynar has exhibited her photos and installations internationally in The Magenta Flash Forward Festival, at Butcher Gallery, Ed Varie, Printed Matter, Paul Petro Special Projects, the Royal College of Art, and COOPER COLE. Her work has been featured in The New York Times Magazine, The New Yorker, 01 Magazine, and Bad Day Magazine. She was listed as one of Print Magazine’s 20 Under 30 New Visual Artists for 2011. In 2016, Cwynar was awarded the Baloise Art Prize at Art Basel. This untitled artwork is a brightly coloured, wall-sized photographic mural, displaying a collage of found images and objects. These collaged images are digitally printed on layered glass panels, and mounted on a wall in a pedestrian corridor within the station. The artist’s practice involves archiving and re-presenting collected visual materials. The source images will deal with a history of representation, as it was created through the products and ideologies of Kodak (to connect to the location of Kodak Heights), and it is intended as a legacy for the local community and future generations. Born 1969. Canadian. Kerbel works in mixed media. In the past decade, Kerbel has garnered commissions from public-art organization Artangel, institutions including Chisenhale Gallery and Badischer Kunstverein in Karlsruhe, and exhibited at galleries including Tate Britain, the ICA London, Kunsthalle Wien and the Whitechapel Art Gallery. In 2011, she won the Paul Hamlyn Award for artists. In 2015, she was a Turner Prize nominee. 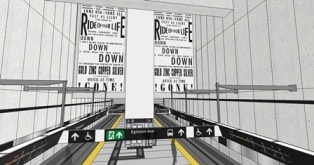 The Ride of Your Life is a series of large-scale mosaic wall works for Caledonia station. Mosaic tile has played an important role in the history of rapid transit – used in signage, architecture and design. Using a process of mosaic traditionally employed for lettering and signage, high contrast black and white tiles will form large-scale text compositions composed of multiple typefaces and sizes. Recalling letterpress posters from early 20th century, The Ride of Your Life will use the hyperbolic language of fairground posters to evoke a sense of wonder. Born 1961. Canadian. Since 2000, Coupland’s public production in contemporary art has gained momentum with speaking and exhibiting engagements at art venues including the Serpentine Gallery, MASS MoCA and the Manchester Art Gallery. Notable public art commissions include Digital Orca (2010)—a “pixelated” sculpture of a jumping whale—in Vancouver and Monument to the War of 1812 (2008) in Toronto, which enlarges toy soldiers to monumental scale. Coupland was appointed to the Order of Canada and in 2014 the Vancouver Art Gallery held the first major survey of his art. Super Signals is based on exaggerations of traditional wayfinding graphics. They intentionally references the transit iconography used across the line. Created from aluminium panels, brightly coloured concentric circles float on a background of contrasting black and white diagonal lines. This series of vivid graphics provides passengers with an immersive experience intended to uplift and amplify the enjoyment of being in transit. Born in 1965, Canadian artist Rodney LaTourelle is known for large-scale colour installations, public artworks and architectural interventions explore the interplay of colour and physical space in an immersive viewing experience. Recent solo exhibitions include Optica (Montreal), Mendel Art Gallery (Saskatoon) and Diaz Contemporary (Toronto). His works have been collected by The National Gallery of Canada and the Musée d’Art Moderne Grand-Duc Jean (Luxembourg). 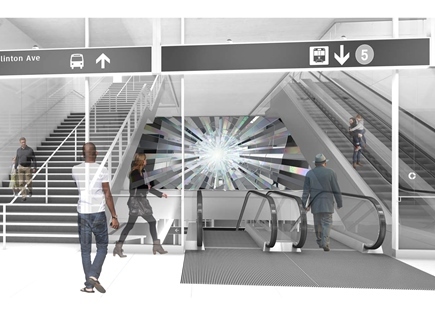 Light from Within, the artwork for Eglinton station, is inspired by the prismatic and reflective qualities of minerals, crystals and gemstones, emphasizing the subterranean nature of rapid transit and the depth of this station. The artwork is a large panel made of dichroic and mirrored glass tiles that are lit from front and back, suspended in a double-height space. 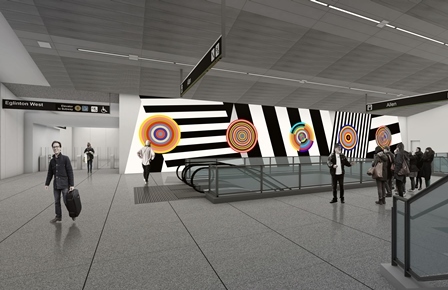 This artwork creates a reflective backdrop and brings light deep into the station, offering a wondrous and unexpected element for passengers. Born 1967. British/American. Known for abstract paintings featuring bright colour fields and graphic line work. She has exhibited internationally, with solo exhibitions at Hamburger Banhof (Berlin), Palais de Tokyo (Paris), Fondation Beyeler (Basel), Museo d’Arte Moderna di Bologna among others. Total Lunar Eclipse is a vibrant “wall painting” that provides an evolving spectrum of colour and geometry that invites reflection on concepts of lights, scale, and motion through the space. The two large wall works are composed of custom porcelain tiles that are silkscreened by hand. For the past few years, Morris has used the lunar cycle as the basis for a series of paintings. She is fascinated by the visualization of the movement of light and how it is thought to affect human behaviour. Born 1981. Polish/Canadian. Known for drawing, painting and collage, her practice includes large scale immersive installations. Her work has been shown at the Walter Phillips Gallery, Banff, the Esker Foundation, Calgary, Contemporary Art Forum Kitchener + Area Biennial 2014, as well as numerous public and private venues across Canada and the US. Over the past two years she has been making work in various residencies nationally and internationally, including China, US, and the UK. Her publications include articles and reviews in Border Crossings, Canadian Art Online, Momus and C Magazine. Reorganization of One Hedge is a site-specific artwork that asks ‘How do things change with time?’ The artist began by reorganizing photographs of the leaves of one hedge photographed in varied lighting conditions over a period of months. The images of leaves were cut by hand and sorted to form a vocabulary of colour – a painting palette. 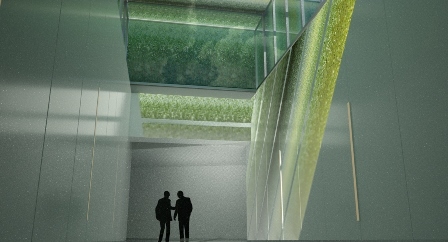 A gradient made from the photo collage will be printed to glass for a skylight, and slim light boxes with the foliage pattern will be inset into the walls of a corridor within the station. Born 1945. American. Known as one of the originators of Conceptual art in the mid-1960s, pioneering the use of words or text in place of visual imagery. He was invited to exhibit at documentas V, VI, VII and IX and at the Venice Biennale in 1976, 1993 and 1999. He has been involved in various artistic collaborations, such as designing album art for John Cale. 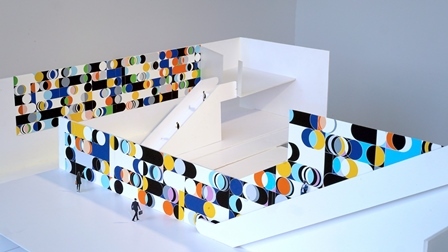 He has been commissioned to produce permanent artworks for public buildings, including the Paul-Löbe-Haus, Bundestag (Berlin) and the Musée du Louvre (Paris). 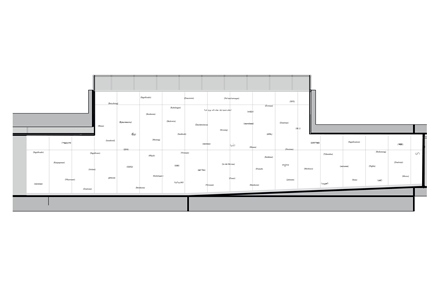 Locations of Meaning (for Toronto) is an art installation for Kennedy station that aims to put meaning in context. The installation is comprised of the word ‘meaning’ translated into the 72 languages spoken in the City of Toronto metropolitan area. Each word is laser cut in stainless steel, and inset into etched tile, creating a wall work that is fully integrated with the station design. Conceptual artist Joseph Kosuth uses inherited meanings, particularly those of language, to construct new meaning in visual work. Toronto will have the largest installation to date in this artwork series.